How did ROSCOE get his name? O’Fallon’s Recycling Committee held a contest and the winner was 10-year-old Kirsten Low, who submitted ROSCOE, which stands for Recycling Our Supplies Conserves Our Earth. Does Roscoe visit local schools? Why did the City get a recycling mascot? The City wants to encourage residents to recycle, for several reasons – first, because recycling ultimately will help preserve our environment, today and tomorrow. Second, because recycling helps the City to keep trash collection costs down. O’Fallon pays $27 per ton of trash sent to the landfill. But O’Fallon gets paid $15.15 per ton of recyclables. 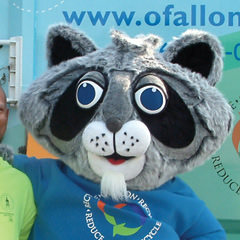 Having a mascot who can visit schools and other organizations, and appear at special events, helps with the City’s efforts to promote recycling. Does recycling cost any extra? No. If you are a resident and a regular customer of O’Fallon’s trash service, you can sign up for recycling absolutely free! The City will provide you with a container to use for your recyclables. More than you might think. And the good thing is that you don’t have to separate the items, they can all go into one container. For more information on recycling, contact the O’Fallon Environmental Services Department at 636-272-0477.